Renew your smile with affordable and reliable dental implants! If you’re missing one or more teeth, you may think that it’s fine to simply live with it. After all, if you still have enough teethto eat and chew properly, and it’s not drastically affecting the appearance of your smile, there’s no need to have the tooth (or teeth) replaced, right? Wrong! As it turns out, even one missing tooth can cause a variety of problems. When a tooth goes missing, other teeth will shift into a different positions to try to fill the gap left behind by the missing tooth. That, in turn, can affect your bite, and that can cause problems with chewing food or speaking. Left untreated for long periods of time, missing teeth can even negatively impact your jawbone or the shape of your face! Fortunately, there are many effective ways of remedying the situation, and one of those is a dental implant. This is one of many dental services that Dr. Kaliher offers to his Austin, TX area patients. Unlike some other options for replacing missing teeth, such as removable dental bridges or partial dentures, dental implants are permanently affixed to your jawbone – making a dental implant just like getting a brand new tooth! A dental implant is, essentially, an artificial tooth with roots that are implanted into the jawbone of the patient. Depending on how many teeth are missing, implants can serve as replacements for the missing teeth, or they can serve as anchors for dentures – either partials or complete sets. Implants are extremely strong and durable. They should last a lifetime, although they may eventually need to be re-tightened or, in rare circumstances, replaced. Dental implants are a permanent form of tooth replacement for Austin patients suffering from tooth loss. 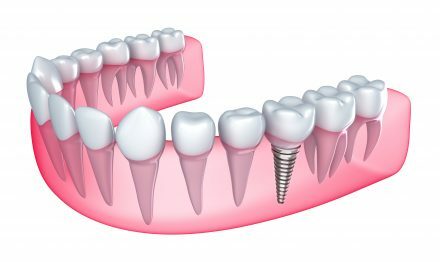 A dental implant consists of a titanium post that is implanted in the jaw bone, as well as a crown, or false tooth, attached to the top. Dental implants look and act like natural teeth – you can eat, drink, brush, and floss without having to remove the tooth or worry that it might come loose. For Austin patients seeking the most convenient, reliable, and attractive tooth replacement option, dental implants are the preferred form of treatment. Nearly anyone in the Austin area can become a good candidate for dental implants. Before the treatment can proceed, you’ll need healthy gums that are free of infection and a jaw bone that is strong enough to support the implant. This could require you to undergo preparatory treatments (such as courses of antibiotics or possibly a bone graft) prior to receiving dental implants. A dental exam will determine whether you are ready to proceed with a dental implant immediately or if you need to undergo other treatment first in order to become a good candidate for the procedure. With proper care, the dental implants you receive in Austin can last you a lifetime. Certainly, the titanium post is designed to last. As for the false tooth on top, it will require the same care you might give your natural teeth or other dental work, like caps or crowns. The false tooth, or crown, can suffer wear and damage over time, just like your natural teeth and other dental work. In general, crowns last about 10-15 years, but they could last as long as 25 (or perhaps longer) with good oral hygiene and proper care. The implant procedure should not hurt. Patients will receive local anesthetic during the procedure to eliminate pain throughout. It is important for patients to communicate any discomfort during a procedure so that steps can be taken to alleviate pain. You may also receive a prescription for pain relief following the procedure, but often ibuprofen is sufficient to treat any discomfort. Discomfort may last for just a few days following implantation, but it is generally entirely manageable with over-the-counter pain relief medication. Residents of the fair city of Austin have plenty to smile about, and you want to do so with confidence. The best replacement for a missing natural tooth is a dental implant. Because titanium fuses with the bone in your jaw, the post for your false tooth is extremely strong and reliable. The materials used for the crown are also tested and proven to act like your natural teeth in almost every regard. Patients will be instructed on how to properly care for implants, including using non-abrasive toothpaste and flossing regularly. As long as you follow instructions, you can expect the same performance from your dental implant as you do from your natural teeth. The procedure involved with implants takes several months. It involves surgically implanting the artificial roots into a patient’s jaw, allowing the roots to fuse to the bone, and finally affixing the artificial tooth to the roots. If you have any questions about the dental implant process, please call our office in Austin and we can answer any questions you may have. For more information about dental implants, or to schedule an appointment with Dr. Kaliher, contact our Austin, TX office today.